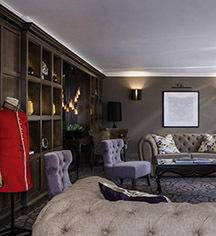 The Castle Hotel Windsor – MGallery by Sofitel began as a simple inn. By the 19th century, the inn emerged as one of the foremost hotels in the area. Sofitel now operates this magnificent historical building as its esteemed Castle Hotel Windsor. With over 500 years of experience providing unrivaled hospitality, the Castle Windsor Hotel is one of the finest places to lodge in all of Berkshire. It features 108 guestrooms and suites that radiate a beautiful Georgian elegance. Sofitel has decorated each space with a design that manages to highlight the hotel’s amazing heritage. The Marco Pierre White Steakhouse & Grill serves up a menu of British classics. And with 12 spectacular conference venues available to reserve for large parties and meetings, the Castle Hotel Windsor is a tremendous destination for entertaining both friends and family. From this historical hotel, the glorious City of Windsor unfurls along the majestic Thames River. Developed around the prodigious Windsor Castle, the community has a reputation for its relationship to the British Royal Family. Many of the city’s exciting cultural destinations abound nearby, with places like the Windsor Guildhall & Museum located just minutes away. Other destinations, such as the Ascot Racecourse and Buckingham Palace, are only a few miles down the road. The Castle Hotel Windsor is situated to allow for guests to revel in the city’s impressive grandeur. 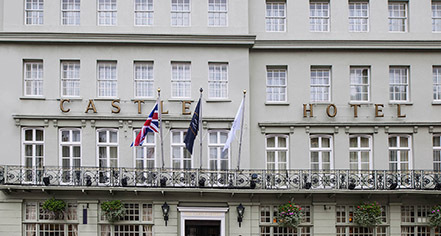 Castle Hotel Windsor, a member of Historic Hotels Worldwide since 2018, dates back to 1528. The Duke of Wellington came to dine at Castle Hotel Windsor MGallery by Sofitel to celebrate his victory over Napoleon at the Battle of Waterloo in 1815. Age Requirements: Minors under 18 must be accompanied by parents or legal representatives. Parking: On-site parking is available; $20.00 GBP per night. Payment: All forms of payment are accepted. Payment is required at time of booking. Visa, MasterCard, Amex, Diners Club and Discover are accepted. Learn more about the History of Castle Hotel Windsor .